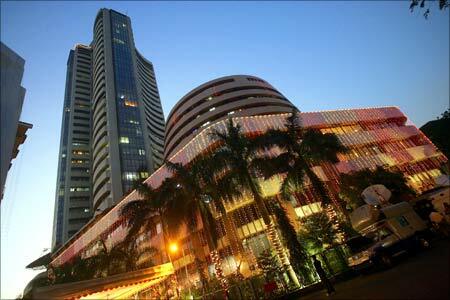 The Sensex ended higher by 416 points at 27,127 and the Nifty gained 130 points at 8,159. Benchmark indices snapped five day losing streak and ended in line with the Asian peers after the US Federal Reserve said it would take a "patient" approach on deciding when to raise interest rates. Also, the Cabinet on Wednesday approved the Constitutional Amendment Bill on the long-delayed Goods and Service Tax which aided the sentiments. The Sensex ended up 416 points at 27,127 and the Nifty advanced 130 points to close at 8,159. In line with the large counterparts, the mid and smallcap indices ended up 2.6% and 3% each. Meanwhile, foreign institutional investors were net sellers in Indian equities worth Rs 1,636.36 crore on Wednesday, as per provisional stock exchange data. The rupee rebounded from a 13-month low hit in the previous session, after the U.S. Federal Reserve said it would take a "patient" approach in deciding when to raise interest rates. It is currently trading at 63.2 against the US dollar. Gold: Gold climbed on Thursday on the back of US Federal Reserve comments. Spot gold was up 0.8%at $1,197.60. On Wednesday, it fell as far as $1,183.73, its lowest since December 1. Brent crude held steady above $61 a barrel on Thursday, bringing a sharp drop in prices to a temporary halt as companies are forced to cut upstream investments around the world. Sectors & Stocks: On the sectoral front, all sectoral indices ended in green. BSE Consumer Durables index was the top gainer up 5% followed by BSE Metal, Power, Realty and Capital Goods indices up between 2-3%. Also, Bankex ended higher by 2.5%. Financials rallied across the exchange. ICICI Bank gained 4%. The bank was in news after being penalised by RBI for violating KYC and anti-laundering norms. SBI gained 1.6% as PSU banks have extended their gains from yesterday. According to Moody's Investors Service, the ability to raise private capital that dilutes the government’s stake is credit positive for undercapitalized public-sector banks because government resources to recapitalize the banks are limited. Axis Bank and HDFC twins ended up between 0.6-3%. Cigarette maker and Index heavyweight ITC gained around 0.7%. According to media reports, tobacco will be covered under Goods and Services Tax. Tata Motors gained 2%. According to media reports, Tata Motors is in the process of developing vehicles for the defence sector, which are capable of carrying weapons. Among other auto stocks, Maruti Suzuki was up 4% and Bajaj Auto gained 2%. Tata Steel gained 2%. The Odisha government has allowed the steel major to resume mining from four key iron ore mines in the state. Hindalco surged 4% and Sesa Sterlite gained 1.5%. Coal India gained around 0.5% after paring early losses . All the five trade unions of the company - which has a work force of 3,50,000 - have served a notice declaring their intention to go on strike from January 6 through January 10. Oil and Gas shares ended the session on a firm note. RIL, GAIL and ONGC ended up between 0.4-4%. Consumer Durables stocks rallied on the bourses after the government initiated steps for one of the country's biggest economic reforms by introducing a bill that seeks to amend the constitution to create a harmonised GST. The jewellery stocks led the rally on the BSE with PC Jeweller and Titan up 15% and 6% each. Other gainers include Rajesh Exports, Blue Star, Bajaj Electricals and Symphony up between 4-5%. Cipla gained around 4%. The Delhi High Court has reserved its verdict on a dispute between pharma firms Novartis and Cipla over manufacturing of the drug Indacaterol, used for treatment of chronic obstructive pulmonary disease. BHEL, NTPC, Tata Power and L&T were some of the notable gainers and gained between 2-5.5% on the BSE. On the flip side, Dr Reddy's share price fell in the light of a sharp intraday fall of Rouble price under the impact of sliding international oil prices recently. The assumption being that the company's revenues will be hit due to the devaluation of Russian currency. The stock ended the session with marginal losses. M&M and HUL were the other prominent losers on the BSE and were down between 0.2-0.5%. Japanese stocks enjoyed their best day in 6-1/2 weeks on Thursday after the U.S. Federal Reserve expressed confidence in the U.S. economy and promised a "patient" approach to raising interest rates, boosting Wall Street shares. Following the global trend, Hong Kong shares finished up on Thursday, snapping five consecutive days of losses, underpinned by a rally on Wall Street. The Hang Seng index rose 1%, to 22,832 points, while the China Enterprises Index gained 0.5%, to 11,331 points. However, China stocks slipped on Thursday as hot brokerage shares cooled on questions about margin trading and investors shifted interest to coming listings. Shanghai Composite index ended marginally lower by 0.1% at 3,058. The market breadth ended positive on the BSE with 2,172 gainers and 684 losers.